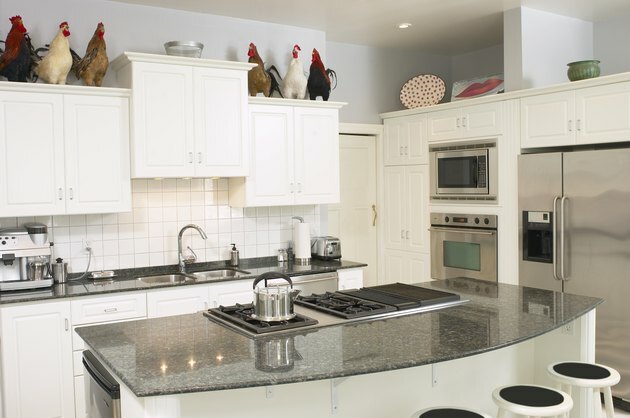 Kitchen countertops often flank a composite sink, made of materials such as granite, quartz or acrylic. Because of the hard surface of a composite sink, you need to use proper cleaning and maintenance techniques to ensure that the sink stays shiny and beautiful. After gently cleaning it, you can restore the coating for a composite sink, adding luster and shine back to the sink's surface. Keep a composite sink shiny and lustrous with regular maintenance. Choose a polishing product suitable for the composite materials of your sink. Use a wax polish if you have an acrylic composite sink. Use a special polishing product created specifically for granite composite. Quartz composite sinks might not require sealing due to the natural hardness of this material; check with the manufacturer of your sink for specific instructions. Moisten the cleaning cloth with water, and squeeze out the excess moisture. Add about a quarter-sized amount of composite sink waxing or polishing product to a clean composite sink. Rub the product into the sink gently, moving the cloth along the grain of the sink. Continue working until you coat the entire composite sink surface with a light layer of the product. Rinse the cleaning cloth with warm water to remove the product completely. Use the wet cloth to remove the product from the sink surface. As you remove the wax or polish, buff the surface until it shines. Dry the sink well with the towel to minimize water spots on the inside of the sink.